A thermoplastic film (100) having a substantially continuous adherent coating (110) on at least one surface, wherein the coating includes a polymeric binder and an additive comprising nano-scale particles (112). When the coating is formed on the surface of the film, the nano-scale particles (112) form a barrier that substantially reduces the diffusion of moisture and oxygen. In preferred embodiments, the coating includes a polymeric binder and silicate particles formed on a base substrate layer (120) that includes a polyolefin selected from the group consisting of homopolymers, copolymers and terpolymers of propylene, ethylene and butene and blends thereof. This invention relates to coating compositions which can be applied to thermoplastic films to provide improved moisture barrier properties and good thermal stability. More specifically, the invention relates to coating compositions which use a polymeric binder and a nano-scale particle size additive to provide improved moisture barriers for thermoplastic films. Polymeric films are used in many commercial applications. One particularly important application is the packaging of food products. Films employed in the food packaging industry are chosen and/or designed to provide characteristics necessary for proper food containment. Such characteristics include water vapor barrier properties, oxygen and gas barrier properties and flavor and aroma barrier properties. In order to impart these desirable characteristics in a multi-layer film, the films are often designed with one or more barrier layers. In addition to providing barrier properties, the layers must have acceptable clarity so that the products can be viewed through the film. Prior art films that used non-halogenic layers or coatings to provide barrier characteristics suffered from poor clarity and found limited use in the food packaging industry. Polypropylene and polyethylene films are widely used in the food packaging industry because of their desirable physical properties, such as transparency and strength. However, polypropylene and polyethylene films do not provide barrier characteristics that are acceptable for many food packaging applications and in the past additional barrier layers have been used to provide polypropylene and polyethylene films with the required barrier properties. Halogenic barrier materials are commonly used in the food packaging industry to impart moisture and gas barrier properties to films which do not inherently possess these characteristics. High barrier halogenic coatings or layers, such as polyvinyl alcohol (PNOH) and polyvinylidene dichloride (PVDC), have been used to provide moisture and gas barrier properties in thermoplastic films that include layers of biaxially oriented polypropylene (BOPP) and/or polyethylene terephathalate (PET). However, PNOH and PVDC are difficult to recycle because they are thermally unstable and tend to degrade rapidly under typical film reprocessing temperatures (350-550°F), (177-288°C). Furthermore, the halogenic barrier materials are relatively expensive and have processing problems that have limited their effectiveness. In particular, when films containing PVDC are irradiated to promote cross linking, they discolor above certain radiation levels. Thus, there has been a demand for a new barrier coating material that gives improved recyclability and improved processing characteristics. Aqueous coating compositions containing, in addition to a water soluble or water dispersible film-forming polymer, one or more additives intended to impart a particular property or characteristic to the substrate to which the compositions are applied are known. The most commonly used coating compositions confer clarity, good slip and good anti-block characteristics upon the film. In addition, coatings containing halogenic polymers, such as PVDC, have been used to impart barrier properties in films but non-halogenic coatings have not been successfully used. It has been discovered that the problems experienced in prior art films can be overcome by the present invention which provides a substantially continuous, adherent coating for at least one surface of a thermoplastic film that includes a polymeric binder and an additive containing nano-scale particles. The nano-scale particles are selected from silica, silicate, clay, organomontmorillonite, calcium carbonate, calcined aluminum silicate, hydrated aluminum silicate, calcium phosphate, alumina, barium sulfate, magnesium sulfate, and diatomacious earth. The nano-scale particles have an average particle size of from 10 nanometers to 100 nanometers and make up 5 to 20 weight percent of the additive. The polymeric binder is an olefinic copolymer containing a carboxylic acid group or its metal salt-functionalized olefinic copolymer and a thermoplastic additive. The polymeric binder is selected from ethylene acrylic acid, ethylene methyl acrylate and ethylene ethyl acrylate copolymers. The thermoplastic additive makes up 40 to 90 weight percent of the coating and the polymeric binder makes up 10 to 60 weight percent of the coating. The thermoplastic film can contain a base substrate layer that includes a polyolefin selected from homopolymers, copolymers and terpolymers of propylene, ethylene and butene and blends thereof. The coating can be applied to the surface of a single layer film, or it can be applied to a coextruded layer of a multi-layer film, using techniques well known to those skilled in the art, including by gravure coating, roll coating or spraying. The coatings of the present invention provide non-halogenic barrier materials for thermoplastic films that are environmentally acceptable because they are readily biodegradable. The coatings also provide a cost-effective alternative to the halogenic barrier materials used in prior art films without sacrificing the high performance required when packaging food products. In addition, the coatings can be applied after the film has been fabricated and so the processing problems experienced with coextruded films having halogenic barrier layers are avoided. Figure 1 shows a side view of a prior art coating containing micron-scale particles. Figure 2 shows a side view of a coating of the present invention containing nano-scale particles. It has been discovered that a layered nano-scale particle dispersed in a polymeric binder provide excellent moisture barrier properties and good thermal stability. Dispersions containing particles of silicates and other materials that are presently in use employ micron- scale particles that are too large to form an effective gas or moisture barrier. The spaces between these micron-scale particles form sites that allow O or H O molecules to diffuse through the coatings with relative ease. In contrast, the nano-scale particles in the coatings of the present invention provide relatively few sites between the particles that can be occupied by O2 and H2O molecules and form an effective barrier layer. While the coatings of the present invention are suitable for application to a wide variety of thermoplastic films, they are especially suitable for application to polypropylene and polyethylene films. Both polypropylene and polyethylene films are well known in the art and widely used in the food packaging industry. Polypropylene films can be the highly stereoregular or highly crystalline type. Preferred polypropylene films are formed by polymerizing polypropylene in the presence of stereospecific catalyst systems. Polypropylene films can also be blends of two or more different polypropylenes. Polyethylene films can be high density polyethylene, low density polyethylene, linear low density polyethylene, very low density polyethylene, or blends thereof. In addition, the films can be multiple layer films having different layers of polypropylene and/or polyethylene or layers that include blends thereof. The present coating composition includes, as a first component, an acrylic copolymer emulsion or solution. The first component includes at least 5 weight percent of a polar, functional comonomer based upon the total weight of the first component. Preferably, the polar functional comonomer can be present in an amount of 5 to 60 weight % and, most preferably, from 10 to 50 weight %. The polar, functional comonomer of the first component can include acrylic acid, methacrylic acid, hydroxyethyl acrylate, hydroxyethyl methacrylate, hydroxypropyl acrylate, hydroxypropyl methacrylate, crotonic acid, fumaric acid, itaconic acid and maleic acid. The principal advantage for having the polar functional comonomer present in this amount is that the carboxylic acid or hydroxyl functional groups are expected to have hydrogen bonding interactions with the carboxylic salt group of the particles, and thus they behave as binding or anchoring agents for the particles. The second component of the coating composition is the nano-scale particles. Nano- scale particles are particles which have a maximum cross-sectional dimension ranging from 1 to 999 nanometers (i.e., 10"9 meters). The nano-scale particles are selected from silica, silicate, organomontmorillonite, clay, calcium carbonate, calcined aluminum silicate, hydrated aluminum silicate, calcium phosphate, alumina, barium sulfate, magnesium sulfate, and diatomacious earth. The nano-scale particles are combined with the first component, the acrylic copolymer emulsion or solution, to form the coating. In a preferred embodiment, the nano-scale particles are formed into an aqueous solution before being combined with the first component to form the coating. The nano-scale particles of the present invention have an average particle size of from 10 nanometers to 100 nanometers and make up between 1 to 20 weight percent of the coating, and preferably between 3 to 12 weight percent. The layered nano-scale particles dispersed in a polymeric binder can be either a water- based coating or a melt-extrudable coating. For example, an aqueous organomontmorillonite dispersion can be easily blended with an aqueous ethylene acrylic acid copolymer dispersion to form a water-based coating. In addition, a powdery montmorillonite can be blended with ethylene acrylic acid copolymer using conventional melt blending equipment to form an extrusion coating. Either of these coatings can be applied onto thermoplastic films to improve their barrier properties. For a small molecule, such as O2 or H2O, to permeate a plastic film, the molecule must be soluble in the film and must be able to diffuse through the film. In an amorphous film, small molecules can occupy the spaces between the molecules, or bundles of molecules, that are only loosely entangled. The polymer chain, or bundle of chains, that forms the amorphous film is relatively flexible and holes open rather easily. These holes allow the small molecules to move within the film structure. Diffusion occurs when these small molecules move from site to site within the amorphous structure until they eventually pass through the structure. For relatively stiff and bulky polymer molecules, movement is slow and infrequent and, consequently, fewer holes open. The halogenic barrier materials used in the prior art combine a highly crystalline structure and a specific chemical structure to restrict the movement of small molecules through films. Crystalline structures reduce the mobility of the polymer system and thereby reduce the diffusion rate of small molecules. In addition, the chemical structures of halogenic polymers have intramolecular bonding, efficiency of packing and polymer chain rigidity which not only enhance the degree of crystallinity but also decrease the rate of permeability. The coatings of the present invention, unlike halogenic barrier materials, do not rely on either a crystalline polymer structure or a specific chemical structure to form an impermeable barrier to moisture and oxygen. Instead, the coatings of the present invention are formed from layered nano-scale particles. These nano-scale particles are so small in size that when they are formed into a layer, there are very few spaces between the particles that are large enough to form sites for the O2 or H2O molecules to occupy. Since diffusion depends on a molecule moving from site to site as it passes through a structure, the tightly packed particles minimize the number of sites in a structure and, thus, limit diffusion through the structure. Especially effective in forming such layers of nano-scale particles are silicate particles. Nano-scale silicate particles also provide good clarity and gloss because the particles are too small to either reflect or diffuse light. Silicate particles that are known in the art and that have been used in coatings are relatively large when compared to the nano-scale particles of the present invention. The silicate particles known in the art are measured in terms of microns. Thus, the micron-scale particles are of an order of magnitude of 1,000 times greater than nano-scale particles of the present invention. Silicate particles have been used in prior art films to improve certain properties of the film, including antiblocking properties. The silicate particles can vary in size within a range of from 0.5 to 15 microns. When used as antiblocking agents, the silicate particles prevent plastic film surfaces from sticking together when they are tightly rolled up on a mandrel but they do not form a barrier. Figure 1 shows a side view of a coated film 100 that includes a base layer 120 with a coating 110 of micron-size silicate particles 112. The silicate coating 110 has relatively large spaces between the particles 112. These spaces provide sites for the O2 or H2O molecules to occupy and allow diffusion through the coating 110. The nano-scale particles of the present invention because of their small size have unique characteristics and novel applications when used in plastic films. It has been found that the size of the particles used in the coatings of the present invention affect the barrier properties of the films. Larger particles, that is particles in the 0.5 to 15 micron range (micron- scale particles), do not disperse as well in polymeric binders as do smaller scale particles and have larger spaces between the particles. Consequently, coatings made using micron scale particles do not have good barrier properties. Silicate coated films 100 that are presently used (as illustrated in Figure 1) have a base film 120 coated with micron-scale silicate particles 112. The coating 110 of micron-scale particles 112 has relatively large interstitial sites between the particles 112 which can be occupied by molecules of O2 and H2O. The large number of sites and their relatively large size provide paths in the structure through which O2 and H2O molecules can diffuse. In contrast, Figure 2 shows the coated film structure 200 of the present invention, having a base film 220 and a coating 210 of nano-scale particles 212 with relatively few interstitial sites that O2 and H2O molecules can occupy. In addition to having smaller interstitial sites, the nano-scale particles 212 of the present invention form a more effective barrier because there are more layers of particles in the coating 210. 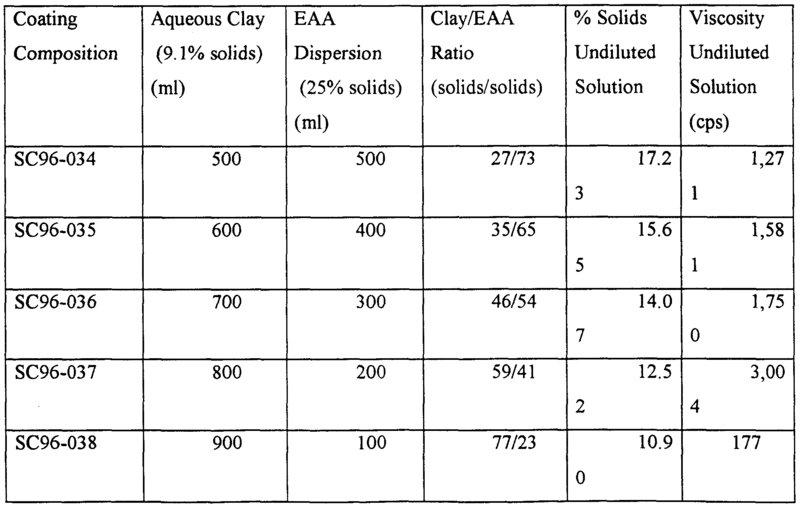 As shown in Figure 1 and Figure 2, a coating 210 of nano-scale particles 212 (Figure 2) when compared to a coating 110 of micron-scale particles 112 (Figure 1) of equal thickness has a greater number of layers of particles between the top and bottom surfaces of the coating. The greater number of particles 212 in the coating 210 of the present invention creates a more tortuous path through the coating 210 and makes it more difficult for O2 and H2O molecules to diffuse. When a molecule diffuses through a structure, the molecule moves from one interstitial site in the structure to another interstitial site. In order for the molecule to pass on to the next site, there must be an adjacent unoccupied site available. If a site is not available, the molecule remains where it is until a site becomes free. The more sites a molecule has to occupy before diffusing through a structure, the slower the rate of diffusion. Therefore, the nano-scale particles 212 of the present invention slow the rate of diffusion in two ways. First, the nano- scale particles 212 decrease the number of available sites that can be occupied by O2 and H2O molecules, and second, they increase the number of interstitial sites that a molecule must occupy in order to diffuse through the coating 210. The base film 220 of the coated film structure 200 of the present invention can be a single layer film, or it can be a coextruded or laminated layer of a multi-layer film. The base film 220 includes a polyolefin selected from homopolymers, copolymers and terpolymers of propylene, ethylene and butene and blends thereof. Preferred polyolefins include polypropylene (PP), high density polyethylene (HDPE), low density polyethylene (LDPE), linear low density polyethylene (LLDPE), polybutylene (PB), ethylene-vinyl acetate (EVA) and blends thereof. The base film 220 can be made using well known extrusion and laminating methods and, in preferred embodiments, the base film 220 is oriented in at least one direction. The coating 210 can be applied to the surface of a single layer film, or it can be applied to a coextruded layer of a multi-layer film, using techniques well known to those skilled in the art, including by gravure coating, roll coating or spraying. In a preferred embodiment, the coating 210 of the present invention is applied to the base film 220 using a dispersion coating process. Dispersion coating of plastic films is similar to a printing process. The base film 220 is unwound from a mandrel and the coating 210 applied at the desired thickness. After the coating 210 has dried, the coated film structure 200 is wound up again into a uniform roll. A gravure coating process is the preferred method of applying coatings because it can apply a thin even coating on films. The preferred coatings of the present invention are dispersions of nano-scale silicate particles and a polymeric binder. The polymeric binder is selected from a group of binders including ethylene acrylic acid, ethylene methyl acrylate and ethylene ethyl acrylate copolymers. In a preferred embodiment, the uniformity of the coating is increased by the addition of wetting or dispersing agents (surfactants), such as a fatty acid. 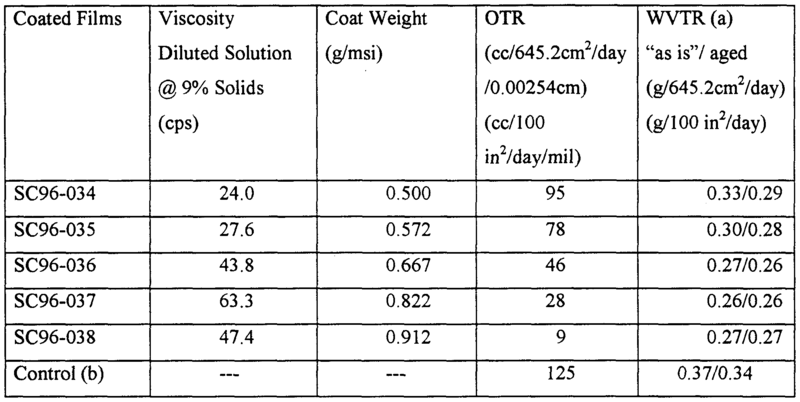 The test results in Table 2 show that films coated with the nano-scale particles of the present invention when compared to the uncoated control film provide improved barrier properties and decrease both the oxygen and moisture transmission rates through the films. 1. A thermoplastic film comprising a substantially continuous, adherent coating on at least one surface, wherein said coating comprises a polymeric binder and an additive comprising nano-scale particles. 2. The thermoplastic film of claim 1, wherein said nano-scale particles are selected from the group consisting of silica, silicate, clay, organomontmorillonite, calcium carbonate, calcined aluminum silicate, hydrated aluminum silicate, calcium phosphate, alumina, barium sulfate, magnesium sulfate, and diatomacious earth. 3. The thermoplastic film of claim 2, wherein said nano-scale particles comprise 5 to 20 weight percent of said additive. 4. The thermoplastic film of claim 3, wherein said nano-scale particles have an average particle size of from 10 nanometers to 100 nanometers. 5. The thermoplastic film of claim 1, wherein said polymeric binder comprises an olefinic copolymer containing carboxylic acid groups or its metal salt-functionalized olefinic copolymer. 6. The thermoplastic film of claim 2, wherein said polymeric binder is selected from the group consisting of ethylene acrylic acid, ethylene methyl acrylate and ethylene ethyl acrylate copolymers. 7. The thermoplastic film of claim 6, wherein said additive comprises 40 to 90 weight percent of said coating and said polymeric binder comprises 10 to 60 weight percent of said coating. 8. The thermoplastic film of claim 2, wherein said film further comprises a base substrate layer comprising a polyolefin selected from the group consisting of homopolymers, copolymers and terpolymers of propylene, ethylene and butene and blends thereof. 9. The thermoplastic film of claim 6, wherein said surface is a coextruded layer of a multi-layer film. 10. The thermoplastic film of claim 6, wherein said coating is applied by gravure coating, roll coating or spraying.